We have a seven-day window in June every year that my family calls “hell week”. Hell week starts with my Birthday on the 15th, followed by our anniversary on the 17th, followed by our daughter’s birthday on the 21st. Father’s Day falls in that same seven-day window every year too. It’s fun. This year hell week culminated with our daughter’s fifth birthday party. We agreed to keep it small this year, and somehow we still ended up with 20 people at our house. We weren’t planning on making a full meal for everyone, but we did make a few appetizers. One of our favorites is smoked chicken wings. This year I decided to add a patriotic flair to my smoked chicken wing recipe. 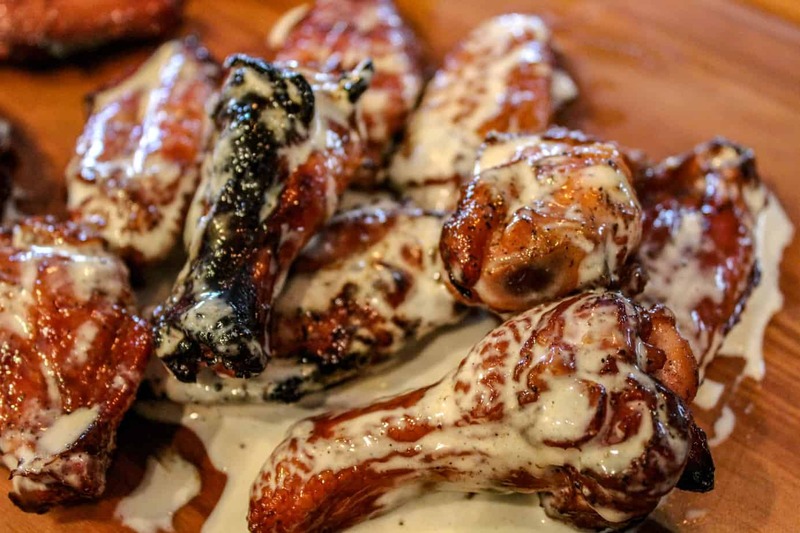 Read on to hear about my Red White and Blue Chicken Wings. I really wanted to make this chicken wing recipe special. I’ve made some really good chicken brine‘s in the past, but I wanted to add a little excitement. We might spoil our daughter just a little bit, and I really wanted these wings to be special. Our family rarely drinks soda, but I had read about people using various soft drinks as a brine. I opted for Cherry Dr. Pepper. About 18 hours before I wanted to cook the wings I put them in a 2.5-gallon zip lock bag with a liter of Cherry Dr. Pepper and 1 cup of kosher salt. The wings sat in the refrigerator overnight to soak up all the cherry goodness. If you want to make PERFECT smoked chicken wings, this is the most important step. Ok, all of the steps are important, but this is the step most people overlook. After you take the chicken wings out of the brine, pat them dry with paper towels. After you’ve dried off all of the wings put them in a bowl that is large enough for you to toss them with some seasonings. For each pound of wings add one tablespoon of your favorite bbq rub or seasoning, one tablespoon of brown sugar, and a tablespoon of cornstarch. Toss your wings in the seasonings until they are all covered, and then throw the wings on your smoker. For this go around I had the wings on the smoker for about two hours at 150 degrees. While the chicken wings were smoking, I made three different sauces. I was going for a patriotic flair, so I made a red sauce, a white sauce, and a blue sauce. The red sauce was the easiest of the three to make, and it’s the same sauce I use when I make my tailgate chicken wing recipe. In a saucepan over medium heat combine one cup of Franks Red Hot and four tablespoons of butter. Continue stirring the mixture until the butter has melted, and then let simmer for about ten minutes over medium-low heat. I really had to do a sell job to convince my wife that this would be good. When I mentioned Red, White and Blue chicken wings to her, she was not thrilled. Surprise, surprise, the white chicken wings were tastiest of the whole bunch. After adding all of the ingredients to your shaker bottle, shake vigorously. That’s it! This white bbq sauce has a fantastic tang that shines on chicken. Like I said before, the chicken wings tossed in this sauce were the best ones by far. Stir all of the ingredients together over high heat. Once the sauce has started to boil reduce the heat and simmer for about ten minutes, occasionally stirring to prevent burning. The sauce will thicken up considerably. Pour the sauce into a mason jar and set aside. After the wings have smoked for two hours at 150 degrees, they’re really close to being done. 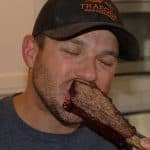 You can probe one of the wings with your Thermapen but I promise they won’t be at the safe eating temp of 165 degrees. Remove the wings from the smoker, and turn the temp up to 400 degrees. Place the wings in a bowl, and toss with the sauce of your choosing, and then return to the smoker. I partitioned the wings out and tossed some of the wings in my Blueberry BBQ Sauce, some in my RedHot sauce, and some in my White BBQ Sauce. Let the wings cook on the smoker for an additional 15 minutes. Check the temperature of the thickest part of a few wings with your Thermapen, and if you’re over 165 degrees, you’re good to go! Remove the wings, and enjoy! I had a blast making this red white and blue chicken wing recipe. I was surprised by how good the different sauces turned out, and how delicious the wings were at the end. The Cherry Dr. Pepper added a nice touch to the brine, and there was a subtle taste of cherry with every bite of a chicken wing. I don’t expect that you’ll take the time to make all three versions of these chicken wings at one time, but I definitely recommend you try each of them at some point. Start with the white sauce. It’s incredible. Smoky, Crispy, and delicious. 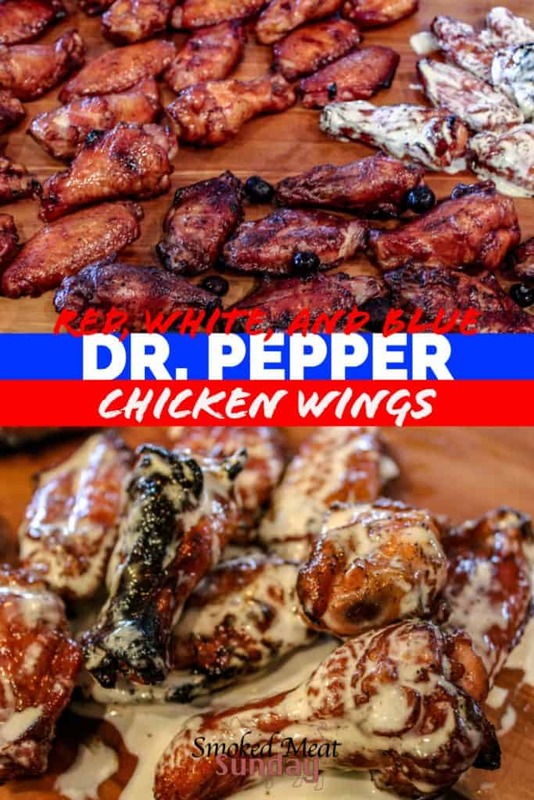 These chicken wings are brined in Cherry Dr. Pepper and then tossed in a patriotic sauce of your choosing. I'll never make chicken wings a different way again! About 18 hours before you cook the wings put them in a 2.5-gallon zip lock bag with a liter of Cherry Dr. Pepper and 1 cup of kosher salt. take the chicken wings out of the brine, pat them dry with paper towels. put the wings in a bowl that is large enough for you to toss them with some seasonings. 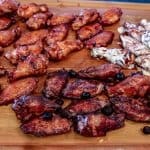 put the wings on your smoker for about two hours at 150 degrees. After adding all of the ingredients to your shaker bottle, shake vigorously. After the wings have smoked for two hours at 150 degrees, they're really close to being done. You can probe one of the wings with your Thermapen but I promise they won't be at the safe eating temp of 165 degrees. 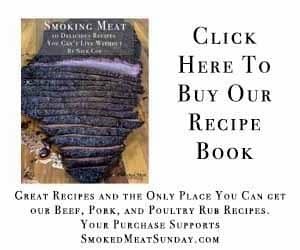 turn the temp up on your smoker to 400 degrees. Place the wings in a bowl, and toss with the sauce of your choosing, and then return to the smoker. Let the wings cook on the smoker for an additional 15 minutes. 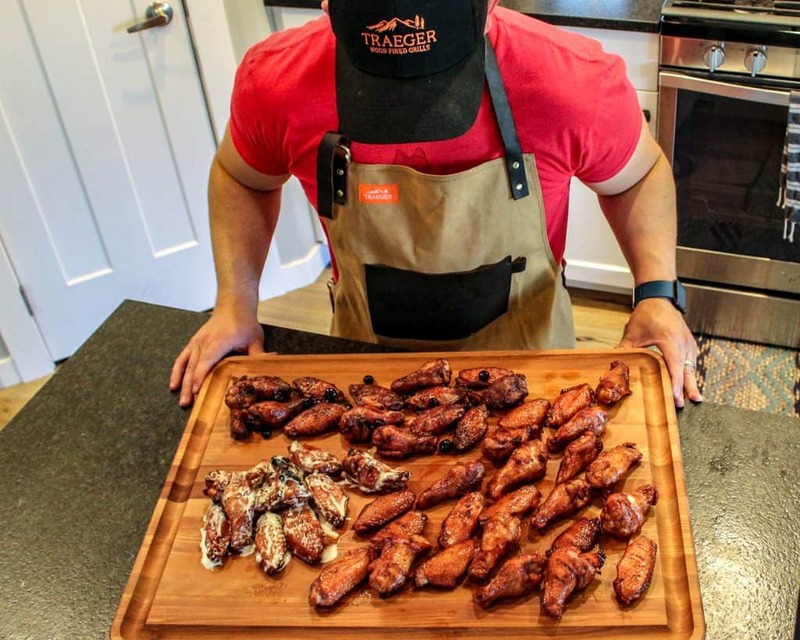 Check the temperature of the thickest part of a few wings with your Thermapen, and if you're over 165 degrees, you're good to go! Remove the wings, and enjoy!